Please refer to our stock # JO39 when inquiring. 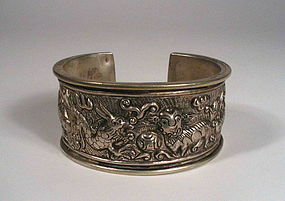 DESCRIPTION: A charming and well executed Chinese silver tribal bracelet, the wide band framed with parallel lines between which various mythical and humorous animals cavort. Included in the hand crafted repousse processional are donkeys, fish, and a dragon vying with a foo dog for a brocade ball. This tribal bracelet comes to us from one of the mountainous Miao groups, who are well known for their beautiful silver work. Estimated to date from the first half of the 20th century and in very good condition. DIMENSIONS: An outside diameter of 3 1/8” (8 cm); band is 1 ½” wide (3.8 cm).